Traditionally, sick leave is paid time off of work that an organization has voluntarily provided for employees as a benefit. Increasingly, however, in recent years, jurisdictions both state and local, are mandating that employers provide paid sick days. Sick leave benefits both the employer and the sick employee. 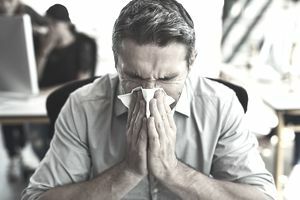 Employees use sick leave when they're temporarily ill and coming to work would pose potential contagion to other employees. Potentially, paid sick leave provides the time employees need to seek medical care for their current illness when needed, too. Some organizations allow the use of sick leave to take care of ill family members, and the spate of current legislation requires this in most cases. In the past, the amount of sick leave was often accrued by employees based on years of service to the organization and the level of their position. Other companies chose to keep sick leave simple: every employee received the same amount of sick leave. In pending and passed legislation, states such as California, however, are mandating that the employer pays one hour of sick pay for each 30 hours an employee works. Coverage is also extended to part-time and temporary employees. It compares to an average of 8.0 days paid currently by employers to employees with a specific number of days granted, after completion of the indicated service or accrued during the next years. For five-year employees, the days jump to 9.5 and after 25 years, the employee receives 10.9 days, on average. There are, of course, differences based on the type of job. Professional, technical, clerical, and sales employees receive, on average, more leave, according to the Bureau of Labor Statistics (BLS). Other companies opt for a paid time off (PTO) policy that folds sick leave, vacation days, and personal days into one bank of days that employees use at their discretion. The discussion about how to account for required paid sick leave in a PTO system has begun. While there are no Federal laws in the U.S. that require an employer to offer paid sick leave currently, employers of choice offer employees paid sick leave as part of a comprehensive benefits package. As mentioned, legislation to mandate employers to pay sick leave is under consideration in many other states and jurisdictions and at the Federal level. In 2007, San Francisco was the first locale in the U.S. to mandate employers to provide paid sick leave. Passage of a sick leave requirement nationally is anticipated; worldwide, most nations require paid sick leave ranging from 5-30 days. Either paid sick leave or PTO, is expected in most industries as part of a comprehensive benefits package. The major employee groups not covered by sick leave policies are part-time employees and employees in the service industry. 98 percent of full-time workers in state and local government. 42 percent of part-time workers in state and local government had paid sick days. 65 percent of all employees in the United States. 84-88 percent of employees had access to paid sick leave in managerial, professional and related positions. 24 percent of part-time employees and employees in the service industry (45 percent) were least likely to have paid sick leave.